“Zurbarán,” first shown at the Palazzo dei Diamanti in Ferrara, and now showing at Bozar in Brussels until 25 May 2014, is the first show dedicated to the artist since the landmark publication of the first volume of Odile Delenda’s catalogue raisonné of the artist’s work in 2009, which identified 286 paintings as being by his own hand. Expertly curated by Ignacio Cano Rivero and Gabriele Finaldi, this skillfully selected and lucidly presented show of 49 pieces offers a comprehensive survey of Zurbarán’s career and is studded with masterpieces. Zurbarán’s father was a textile merchant in the village of Fuente de Cantos in southern Spain, where the artist was born in 1598. Francisco was apprenticed to a now forgotten local painter in Seville from 1614 to 1617, during which time he met Velázquez, who became a lifelong friend. But whereas the latter forged a career in the courts of Madrid and Rome, becoming the leading portrait painter of his age, Zurbarán had a vocation for religious painting (and a deep knowledge of Spain’s mystical thought and literature). Having moved to Llerena, in his native province of Badajoz, in 1622, the artist received a commission for 15 canvases for his birthplace. By the mid 1620s he was also sending cycles of works to Seville, where in 1629 he was invited by the city council to take up residence and where he would spend most of the rest of his life. Although Zurbarán never set foot outside Spain, by the time he was training as a painter Caravaggio’s work was well known there. But whatever lessons Zurbarán learned from Caravaggio, his own paintings, not to mention his subject matter, remained distinct from the outset, not least in the intense spirituality with which he infused his images. Zurbarán’s vibrant still-lifes have been a key element in stimulating the rediscovery of this artist in modern times, though he did only a handful of independent works in this genre. Two of the most celebrated, “A Cup of Water and a Rose” from the National Gallery in London, and “Still-life” from the Prado in Madrid, are on display here. The pious message of these pieces tends to be overlooked by modern viewers. For Zurbarán’s contemporaries, the rose in the National Gallery picture, for instance, would have had clear associations with the Virgin Mary, and the white cup with purity and the Immaculate Conception. These still-lifes were evidently popular in the artist’s own times, as he produced several versions of some of them. And beautifully executed still-life elements play an important emblematic part in many of his other paintings — from skulls, flowers and bowls of fruit to the brilliantly lit earthenware jug, bread, olives and radishes, representing the eucharist and Christ’s humility, in “Supper at Emmaus,” on loan from the Museo Nacional de San Carlos in Mexico City. The artist’s studio in Seville produced a large number of canvases specifically for export to the New World. These were typically sold at the annual fair in Portobelo, Panama, and most ended up in Peru, where many can still be found. 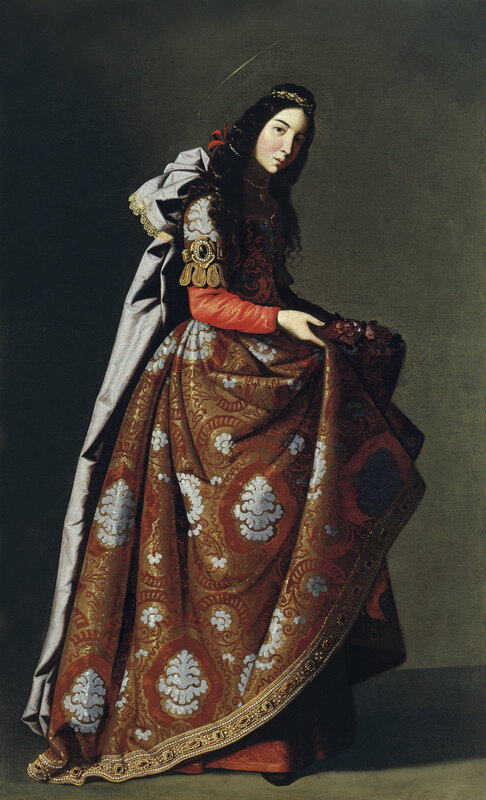 A high proportion of these pictures, executed by Zurbarán’s assistants, were of Biblical patriarchs. By the time Zurbarán was in his 50s, Seville was suffering an economic crisis as a result of a diminution in trade with America and of the wars in Europe, further worsened by a plague in 1649, to which he lost his son Juan, a promising still-life painter. He also found himself challenged by a new generation of artists, above all Murillo. In 1658 Zurbarán moved to Madrid, where he remained until his death in 1664. As the last two rooms of the Ferrara show reveal, his style and palette underwent radical changes there, particularly under the influence of Raphael, whose works were by then well represented in the Royal Collection. This entry was posted in News and tagged Auckland Castle, Belgium, Bozar, Brussels, Exhibitions, Grimesthorpe, News, Zurbarán on February 17, 2014 by M. Ellis.